Finally a successful uncrack butter cake. Of course this is the famous blogger recipe Mrs NgSK's butter cake. However I did some modification and have a chocolate mixed in it , thus it become the Zebra Butter Cake. When I was young, every Chinese New Year my grandpa will get some buttercakes from a small cake shop in Skudai. In my memory the butter cake was uncrack and with chocolate swirl in it. Each time if anyone mention butter cake, it should be this style and this type to me.This is a childhood thing we have in our family . Now my grandpa has gone so is this little cake shop. Each Chinese New Year when siblings gather together , we often will talk about the butter cake we have since we were a child. So these is the reason why I have modify the butter cake recipe and hopefully it will bring back some childhood memory to myself during this near festive season. 200gm self raising flour, sifted. 2. Separate the eggs, and place the whites into a medium sized bowl .Beat egg whites until soft peaks, gradually add 50gm sugar and beat until stiff. Set aside. 3. Cream butter and 110gm sugar until pale and fluffy. Put in vanilla extract and and beat for a while. Put in egg yolks one by one and beat well after each addition. 6. Separate the batter into half. ( you can measure exactly or estimate), mixed in the melted dark chocolate into one of the batter and fold in well. 7. Use a ladle to scoop the vanilla batter into the round pan, use another ladle to scoop the chocolate batter on top to the vanilla batter in the round pan. 8. Repeat step 7 until all the batter is finished. 9. Level the batter in the pan. I add in Baileys as I found it make any chocolate dessert smell great . 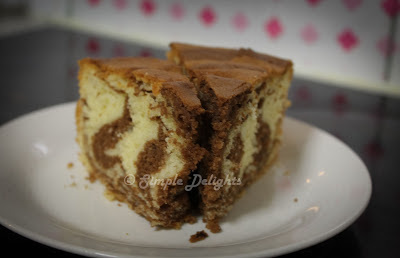 This batter is quite thick is not easy for me to have an even style as Zebra Butter cake should be. So here is my Zebra Butter Cake. 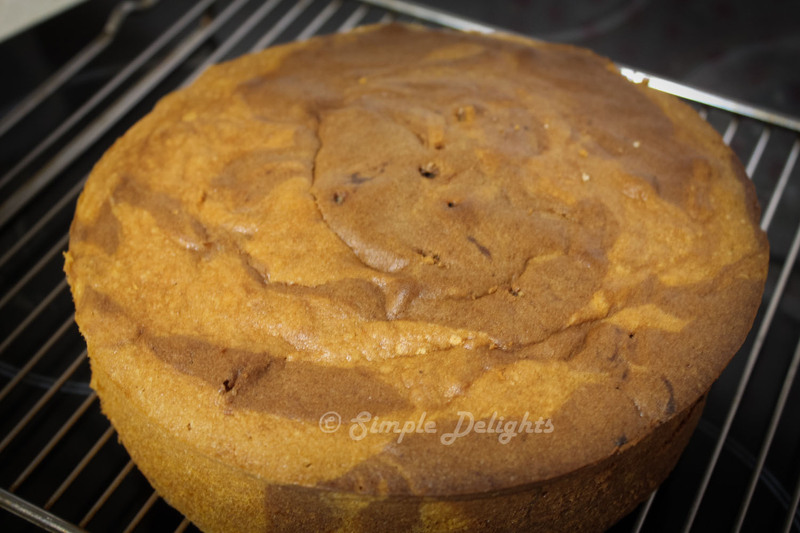 The taste is moist and yum , we did not wait till it cool but have our cake as a supper treat on that night. Warm butter cake is irresistable. I gave a quarter of this cake to a close family friend. Another group of friends come for dinner the next night , they can not resist the cake and nearly forget to keep a slice for the one who come late. The most funny thing was, some gals wanted to share instead of having a whole piece, but after sharing the one slice , they decided to cut one slice each for themself.